Please pause for a moment of silence in memory of the 17 lions, 18 Bengal tigers, and all the other animals who were killed...senselessly, in my opinion...on October 18 and 19. Such a sad thing to have occurred. It's very sad about the animals that were killed. very cute and fun photos Michelle. That makes me sad, too. I didn't really know about it until today, because I've been offline more or less. So sad. 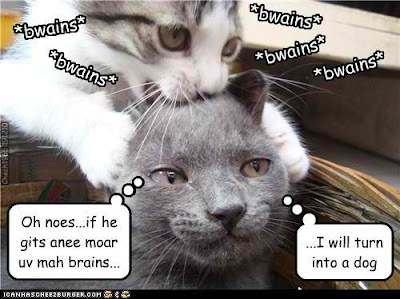 I really like your vampire and zombie kittehs. But that second picture is hilarious. Usually, I luv grey cats, but this one just fits Halloween. (:: I know. I'm being a humbug. Gollee, I almost missed the main event, the orange vampire. Wow, I'll have a nightmare tonight. Have a spooky Halloween. We have another Thursday, I think. I love the kitties today! *P.S. In memory & with respect for the Big Cats, & all of the critters, who were so senselessly lost in Ohio...the Rainbow Bridge is there for them, too. You have the best pictures! I love the bwains one. I agree, so sad to lose so many helpless animals. Saw the pics on your fb page.. horrible! 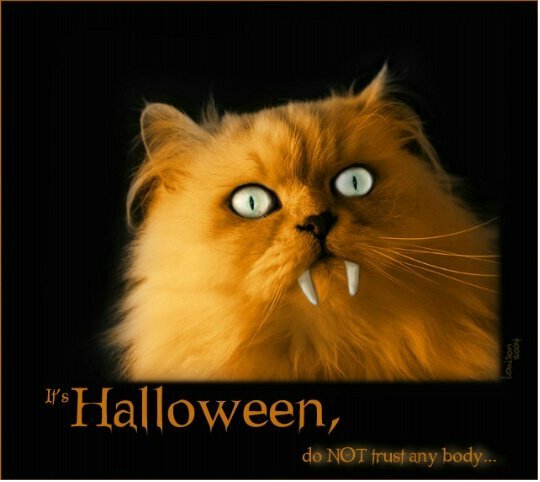 But also thank you for that funy "zombie cat" picture..